1. Preheat the oven to 180˚C, gas mark 4. Butter and base line a round, 23cm-deep cake tin. Cream the butter with the caster sugar until pale and light then beat in the syrup followed by the eggs, a little at a time. Stir in half the marmalade. 2. Sift the flour with the baking powder and spices and fold half into the creamed ingredients. Stir in 150ml of the milk, then the remaining flour mixture to give a stiff, creamed consistency. Spoon into the prepared tin and smooth the surface. Bake for 55-60 minutes until golden and well risen. A skewer should emerge dry from the middle of the cake. Turn onto a wire rack and leave to cool, base-side up. 3. 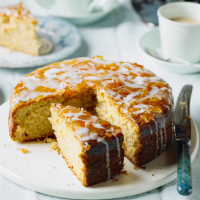 When the cake is cool, heat the remaining marmalade in a small pan until warmed through then spread over the cake. Mix the sifted icing sugar with the remaining milk to give a thin icing. Drizzle over the cake letting the icing go down the sides. Leave to set then serve. This recipe was first published in January 2012.